While the Vegas Strip has its own time and place, I definitely am more of a fan of Fremont Street and the area surrounding it, commonly referred to as downtown Las Vegas. 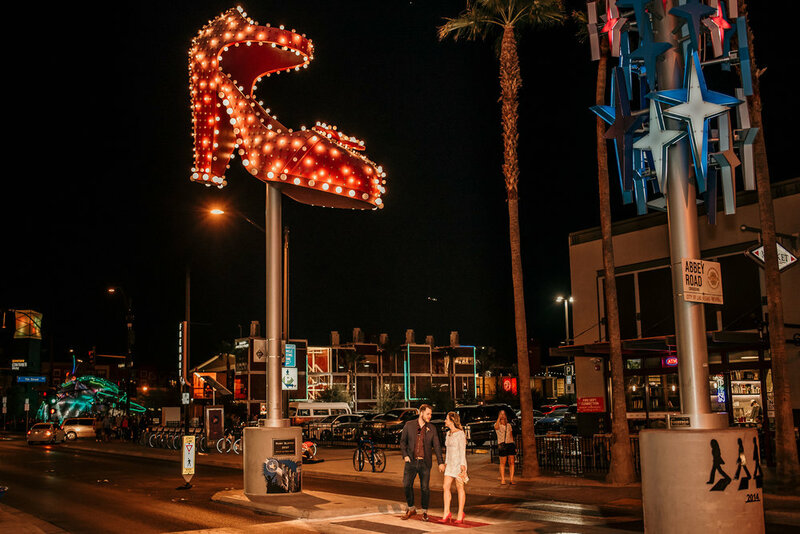 Full of neon signs oozing kitschy Old Vegas charm and jaw-dropping street art, Fremont Street is the beating heart of Las Vegas’s arts scene. Grab a drink-to-go from one of the many streetside bars, gape at the street performers, and be sure to look up for the zipliners being catapulted out of a (what else?) giant slot machine over head. 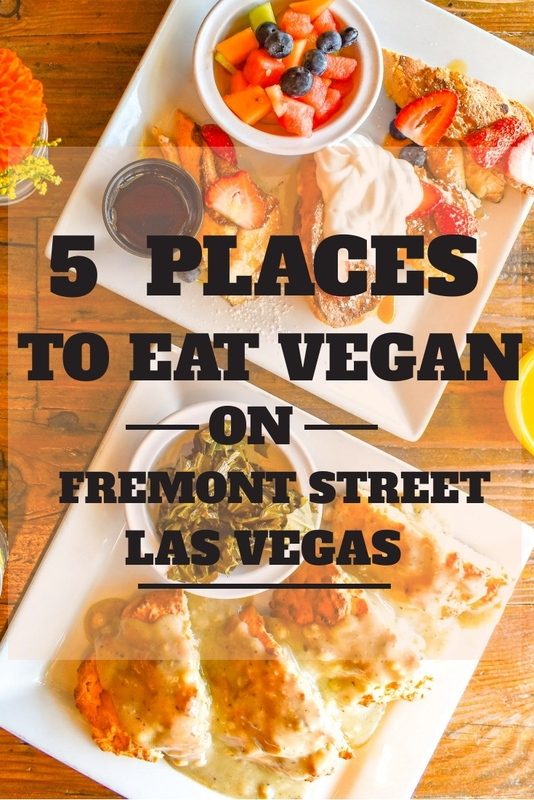 It’s easy to lose track of time wandering around Fremont Street- good thing that there’s a wealth of awesome vegan options close at hand that you can grab between strolling around, taking in the lights, and maybe even trying your luck at a poker table or two. Note- All photos where my husband, Justin, and I are dressed up in wedding garb are by Tiago Pinheiro, who you should 100% hire if you need a photographer in Vegas; all other photos are our own. The most famous of the ever-growing choices of all-vegan restaurants on the Vegas scene, Vegenation dishes up unique takes on breakfast classics, like strawberry and cream stuffed French toast, as well as comfort food with a globally-inspired twist for lunch and dinner, like chicken pot pie gnocchi. I’ve been here on three occasions with different groups of friends each time, and I’ve never heard a single one, even the meat lovers, leave disappointed by the food. With a bright and cheery atmosphere, full of colorful paintings and green house plants thriving in every corner, Vegenation is the perfect spot for a bachelorette party brunch (check out my guide to Vegas bachelorette parties here) or a casual date night. Make sure to come hungry- the portion sizes are HUGE, and with tempting options for appetizers, entrees, and desserts (how do you choose between Asian barbecue bao buns to start, or chocolate tacos smothered in salted caramel sauce to end your meal? Impossible! ), so this may be one to break out the fat pants for. Just around the corner from Vegenation is Bronze Cafe, the secret vegan gem of Las Vegas. Tucked inside a fresh juice store called “Juice Stars”, Bronze Cafe dishes up a TON of vegan options with its variety of soups, salads, and sandwiches, making it the perfect stop for lunch or a casual, healthy(ish) dinner. Bronze Cafe serves up creative takes on standard lunch fare, with dishes like the Whoop Whoop sandwich, made from oven-roasted tofurky, pepperoni, mixed greens, tomato, red onion, basil aioli, and oregano vinaigrette, or The Guac & Mole sandwich, featuring avocado, mole sauce, alfalfa sprouts, shredded carrots, and cucumber, smothered with ranch dressing and lemon vinaigrette. You can polish off your meal with one of their many housemade vegan baked goods, which sound like they were dreamed up by your closest stoner buddy friend- think Fruity Pebble Rice Krispie treats or a cookie-brownie hybrid. When my husband, Justin, and I went here recently, the menu was a bit different, with breakfast and brunch offerings available as well. Our food was PHENOMENAL (chicken and beignets all day!) and I cannot WAIT to go back to try out the rest of the food. And while the downtown Bronze Cafe no longer dishes up breakfast fare, the good news is that its Summerlin location (2380 N Buffalo Dr Ste 110, Las Vegas, NV 89128), which is expected to open sometime in 2019, will be offering your favorite morning eats. It will be worth the cost of the Uber- trust me. Flippin’ Good has only one vegan entree on the menu, but it’s, well, really flippin’ good. This sports bar serves up a comically large fried chick’n patty, smothered in a house made sauce with a hint of kick, and served on a pillowy bun. The sandwich comes with a side of fries, but if that’s not enough fried grub for you, order up some Nashville fried pickles or onion rings (helpfully labeled as “vegan” on the menu). Not only did I immensely enjoy the sandwich here, but the environment is fun as well- this open-air eatery is absolutely perfect for people watching the fascinating passersby of Fremont Street. Select a beer from the draft list of local brews, watch your fellow bar patrons play beer pong on the patio, and chow down on some delicious fried grub that will surely help stave off tomorrow morning’s hangover. Find yourself on Fremont Street at 3 am, with an awful case of the munchies? Head on over to this Evel Knievel-themed pizza joint, where they are happy to craft you up a slice of vegan pie. Evel Pie offers one specialty slice of vegan pizza every day; when we went the topping du jour were olives, red onions, and peppers. While my favorite thing about this place (besides the obviously awesome kitschy decor) is the availability of pizza on a slice by slice basis, you can also create your own 20-inch pizza with fixings like serrano chilies, pineapple, and habanero. My husband and I actually went to Evel Pie right after our Vegas wedding (read more about our shindig here) and I couldn’t imagine a more perfect place to end our lowkey and slightly offbeat wedding festivities; we happily chatted with our friendly tablemates, sipped on local brews from the restaurant's impressive tap list; and of course, nommed down on a slice. I love a place with history and Atomic Liquors is filthy with it. 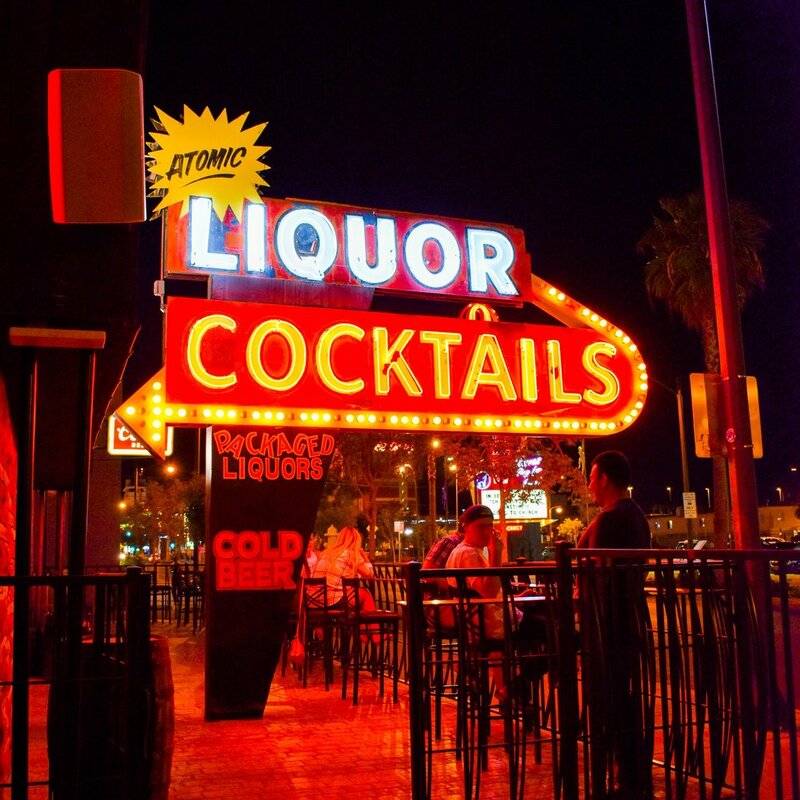 Not only is it the oldest freestanding bar in Vegas (serving up drinks since 1952), it was named after its clientele’s habit of climbing to the roof to watch the nearby testing of atomic bomb blasts and was frequented by celebrities in the Rat Pack heyday, from Barbara Streisand to Old Blue Eyes himself. While retaining its retro charm, nowadays, the bar feels more like a hip cocktail lounge for locals, boasting a huge open air patio and unique libations, like the smoky goodness Garden Mistress (a concoction of mezcal, Ancho Reyes chili liqueur, grapefruit juice, house-made cilantro syrup, and lime). If you’re feeling a bit peckish, you can order something light to munch on, like a roasted pepper, tomato, and olive plate or, my old standard, a side of fries. Alternatively, inside the bar, you can grab a more hearty dinner, like the braised mushroom tamale, topped with a pumpkin seed pesto, or the BBQ-spice rubbed cauliflower (ask for no grits, sub with sauteed mushrooms and herbs). On weekend mornings, swing by for brunch and pick up a plate of Brussels Sprout Hash, with shaved Brussels sprouts, mushrooms, and celery root on a thick slice of grilled toast (ask for the dish to be cooked with oil, instead of butter); of course, Atomic Liquors has a whole host of fun breakfast cocktails, like a the Summer Camp Old Fashioned, featuring Dickel No. 8, Amaro di Angostura, smoked blackberry syrup, and grapefruit juice. Note that the kitchen only serves food Wednesday through Sunday and has more limited hours than the bar itself, but, even without the food offerings, this joint is 100% worth taking in a perfectly-crafted cocktail or two and soaking up some Vegas history. I think on my next trip to Vegas (I’m somehow going twice this next month! ), I’m going to try to find some great food choices on the Strip itself- any recommendations or thoughts? It seems like the Vegas vegan scene is growing fast and furious so I’d love to hear your thoughts- let me know in the comments below!